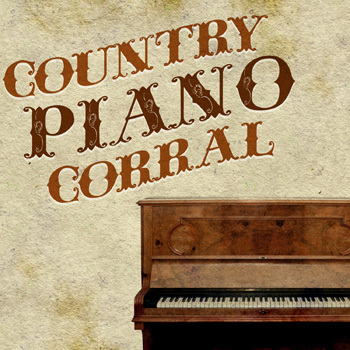 Digital Download Music Art - "Country Piano Corral"
This is another country music compilation for a long running client. During my run with Wellington Beck, I specialized in quick turnaround Photoshop designs for their recordings. This time around, the album features all piano based covers of popular country hits. It is available exclusively as a digital download mp3 album on iTunes and Amazon, as well as other media outlets. Since the word “CORRAL” is featured in the title, I decided I should give it a 19th Century American Old West feel. The art features a vintage style mahogany piano in the bottom right. I set the album’s title in a curly Western font, then warped it into a rising shape. I also embossed the text to give the words depth. All the while, I used two different brown tones to bring some variance to the title. The word “PIANO” is larger than the other words, and I emphasized in a darker brown hue. This color echoes the dark shadows in the piano image and ties it all together. The old timey elements all display on a dirty, distressed parchment paper background. My idea with using this was to mimic the feel of a wanted poster for an 1800s desperado. Finally, I added a grunge texture overlay to complete the country music piece’s weathered appearance. This gave it the exact style my client was looking for. As usual, I finished the art ahead of the scheduled deadline, and I did not need to make any revisions to it. Whether or not your genre is country music, I’ve got your art needs covered. I’ll be your Huckleberry. Contact me today for the perfect graphic design to complement your new single or album! January 24 is National Peanut Butter Day in the United States. Copyright © 2019 Derek Price, Graphic Designer. All Rights Reserved.